Leftover coffee and wine make a lucious sauce for ordinary beef roast! The combination of coffee and wine doesn't sound particularly appealing, but after cooking this tasty beef dish over slow and low heat, all of the flavors combine for a for a surprising taste sensation. The sauce is rich and savory and you'll wonder why you never thought of combining leftover coffee with leftover wine before. This recipe is easy enough to make for a weekday meal and special enough to make for company. It is also very flexible and lends itself well to substitutions, additions and personal preferences. 1. If using a cut of beef like chuck or pot roast, cut into chunks and season liberally with salt and pepper. 2. Warm a cast iron skillet (or your favorite frying pan) over high heat and coat with the oil. 3. Add the beef and brown on all sides until golden and a nice crust forms, approximately 6 or 7 minutes. 4. When done, drain the beef on paper towels. 5. Deglaze the pan by pouring the wine and coffee into the skillet, cooking over high heat until the mixture is reduced by about one-fourth (approximately 2 minutes). Be sure to scrape up all the brown bits on the bottom of the pan and combine with the wine and coffee mixture. 6. 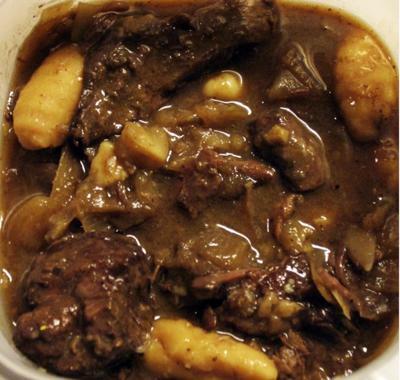 Once reduced, put the beef, onions, garlic, salt, carrots and frozen gnocchi in the slow cooker. 7. Pour the wine and coffee mixture over the beef, put on the cover and cook on high heat for 4 hours. 8. Uncover, and put in the frozen pearl onions. Cook until the beef is fork tender, approximately one hour more on high, or another 4 hours on low. 9. If you want to thicken the sauce, use a little cornstarch or Wondra flour. 10. Serve over couscous, rice or noodles, if desired. This recipe makes a very rich and yummy recipe. If you have any leftovers, they heat up nicely in the microwave. But this is such a tasty dinner entree that leftovers are very rare!